We arrived back in San Diego late Saturday night and since then have been immersed in attending to the health crisis of Steve’s mother that prompted us to cut our trip short, along with the messy task of filing a “Trip Interruption” insurance claim and dealing with other re-entry issues. 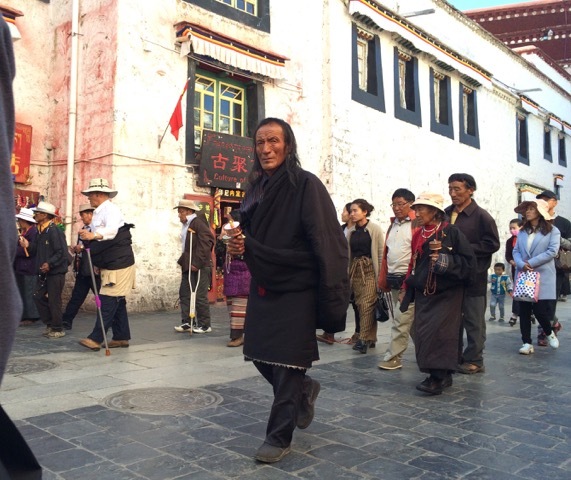 With every hour that passes, the memory of our all-too-brief visit to Tibet fades further. The way it’s going, in another week or so, any memory that I was ever there will have vanished. But we were there, in a land that, as Steve observed at one point, has less in common with modern American culture than perhaps anywhere else we’ve ever been. To help preserve some shred of what we experienced, let me describe what seemed to me to be the Three Most Un-American Tibetan Things. 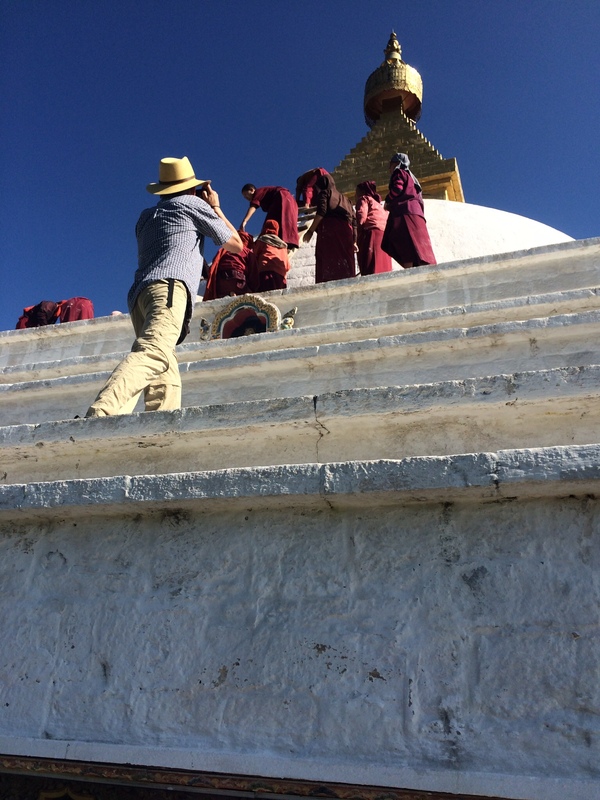 Our guide Tashi disclosed that he was working on saying his favorite mantra 100,000 times. His set of beads helps him keep track of how close he is to achieving that goal. — Mass ritualized walking. The former sovereign country (and current Chinese “autonomous region”) of Tibet contains a staggering number of places considered by Tibetan Buddhists to be sacred. The faithful believe that as a result of visiting these places and doing certain things at them, good things will happen. For example, by journeying to specific peaks, one can make amends for specific sins. To boost the power of the visit, an almost universal tactic is to walk in a clockwise direction around the sacred thing. 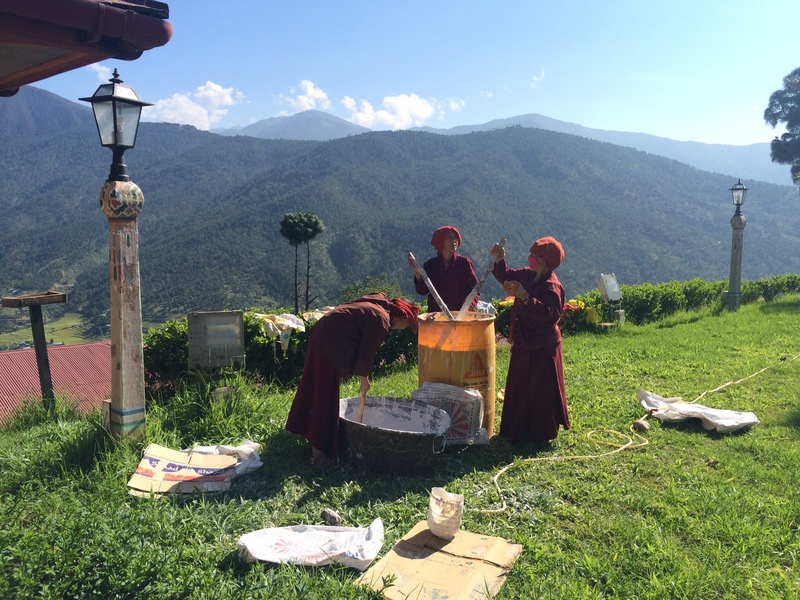 This is known as making a kora (or circumambulating), and you can do it around something as small as a prayer wheel or as large as a mountain. Most people recite mantras as they walk, Om Mani Padme Hum being the most famous one. But there are bunches of others. Tibetans use complicated prayer beads to keep track of how many times they say their particular mantra. The most devout folks also engage in elaborate prostrations in which they go from standing to lying face-down flat on the ground, then back up again, over and over. Some combine prostrating with circumambulating, then taking a step or two sidewise between each trip to the ground. They do this hour upon hour. This fellow was prostrating himself around the kora route. People use various devices to protect their hands as they slide they forward and downward and back up again. This large group of people was prostrating in one place, en masse. Most people walk and pray, but some walk and check their cell phones. 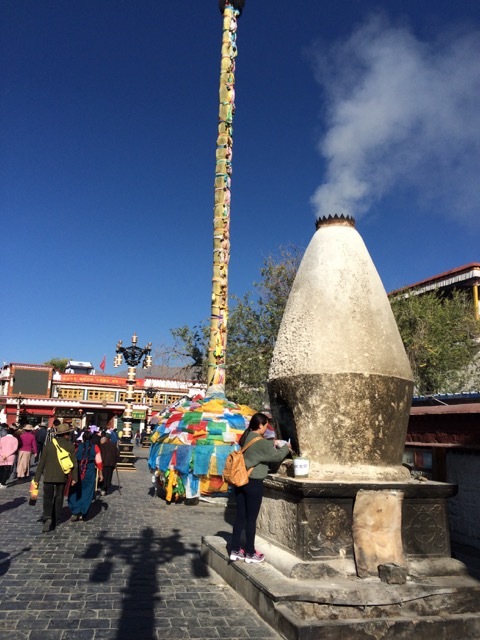 Pilgrims circumambulating the Jokhang Temple often stop to add damp juniper sprigs to these offertory ovens. 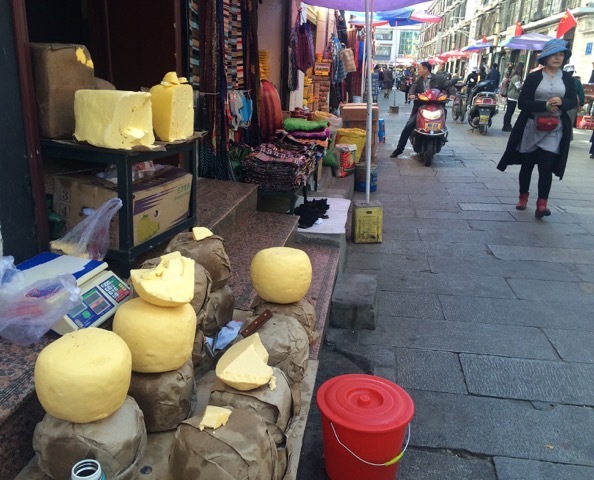 The result is a lot of fragrant smoke that make the normally clear air of Lhasa much more closely resemble that of other Chinese cities. — Yaks R Us. Considering that wild yaks are almost extinct (down from a million 50 years ago to only 15,000 or so today), the yakly presence Tibet is pretty amazing. The animals are cultivated (and often cross-bred with cows), and virtually every part of them (from their milk to their skin and hair to their dung) is used enthusiastically. 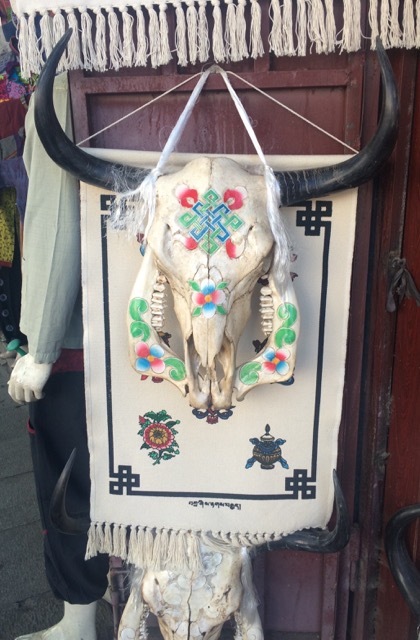 Yak skulls make nifty home decorations! — The Potala Palace. 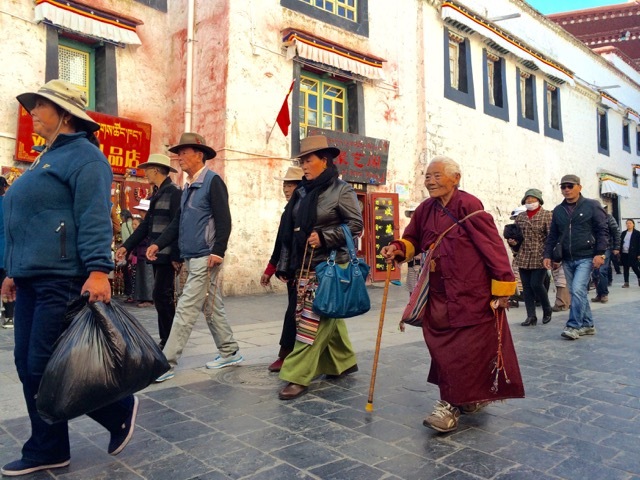 During our abbreviated stay in Lhasa, we managed to visit four of the city’s major landmarks (two palaces, the most important Buddhist temple in the country, and a monastery.) 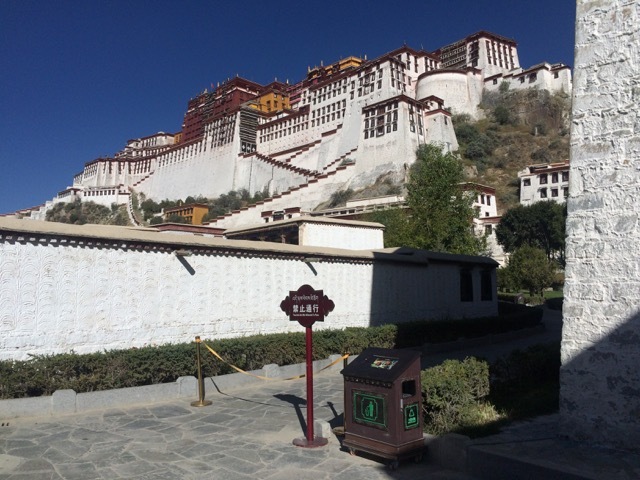 All were interesting, but the Potala Palace is in a special class. It’s the class that includes the Great Pyramid, Eiffel Tower, and Angkor Wat — the most striking buildings erected over the course of human history. Note the view from our hotel rooftop of the Potala Palace on the hillside in the distance. The view of the palace from the base of the hill. Situated on a hillside that dominates the entire city, the Potala served as home to every Dalai Lama from the 5th to the 14th; 8 of the former rulers are entombed in sepulchers adorned not only with precious gems but (literally) tons of gold. The whole complex includes more than 1000 rooms, and even though today it’s a somewhat sterile museum, rather than the pulsing, vibrant, devotional center that the Jokhang Temple is, it’s actually hard for me to imagine I could ever forget the sight of it. Had we not cut the trip short, we would have visited at least one more temple and another monastery. But perhaps it’s just as well we missed them. I’m pretty intereste d in Buddhism, but after only two weeks in Buddhaland, all the various orders and bodhisattvas and protective deities and other key historical figures were starting to overwhelm me. Toward the end I sometimes pretended to be meditating, just to escape the explanatory litanies about the over-the-top ornamentation. On the other hand, had we not cut the trip short, we would have made that legendary cross-China train journey. On a third hand (something you see a lot of in Buddhist temples), we’re already in the midst of a different sort of journey back here at home. As with all journeys, all we can do it buckle up and appreciate the present moment. Events have shoved us off the Roof of the World. Never before have Steve and I had to cut short a journey and return home. But in the present case, it seemed unavoidable. We were supposed to get from Lhasa to Beijing by train! But we were grateful to get the last two seats on a plane, since we needed them. We first learned that an emergency was brewing around 2 a.m. Tuesday morning, when the ringing of Steve's phone woke us up. (Or rather, woke Steve up. I was awake, struggling to breathe in enough oxygen.) It was a call from the retirement complex where his 98-year-old mother, Carol, resides. Although increasingly frail, Carol has been able to live independently at the White Sands, just 10 minutes from our house. Although Steve failed to get to his phone in time to answer the call, he almost immediately received a text message from our older son, Michael, who also had been contacted by the facilty staff. Eventually, we figured out that Carol had been unable to get out of bed and was being taken to the hospital for evaluation. Trying to discern what was going on over the course of the next few days was challenging. China is 15 hours ahead of the US, so the only reasonable time to converse with San Diego was early in the morning, China time (when it was late afternoon back home.) Our younger son and a close family friend finally determined where Carol was and managed to visit her, and for a day or two, she seemed to be doing okay. But Thursday morning we heard she would be undergoing surgery the next day. This seemed drastic enough that we decided we had to return home, as quickly as possible. Now that I've done it, I can report that if you have to make a bunch of last-minute travel arrangements, Tibet should not be your first choice to do it from. When you can get access to the Internet, it's slow, and the Chinese government limits what you can see (no Google! no Facebook! no gmail! etc.). When we informed Tashi, our guide, and Woeser, the tour company director, that we needed to cut our trip short, they were sad but understanding. Caring for one's parents is still a pretty serious duty in China. They said there was no way to try to book the flights online, and Woeser seemed to be saying that if we went to a travel agent, we wouldn't be treated professionally; that it was better to go to the individual airline offices. That sounded strange, but we were game. Tashi, Steve, and I hailed a taxi and went to the intersection where Tashi thought the Air China offices were located. We got out and scrutinized the millions of Chinese characters on the nearby buildings but saw no clue to what we were looking for. We tried all four corners of the intersection. Finally Tashi talked to a local shopkeeper who assured him Air China was nowhere in the vicinity. We hailed another cab; drove to another part of Lhasa, and when we got out, we spotted the offices of both Air China and China Eastern, not far from each other. 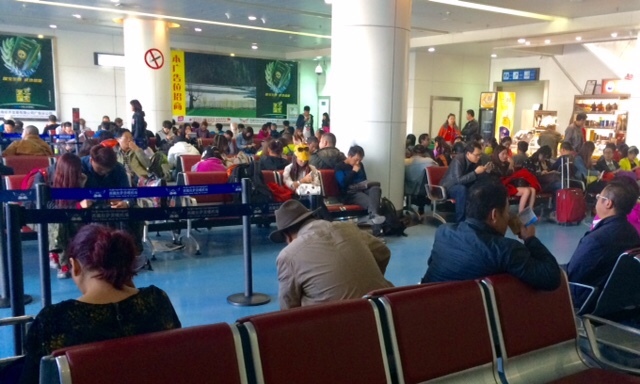 Inside the large Air China office, only 2 employees were evident. One was assisting a customer. The woman next to her sat behind a large sign saying “Manager.” But she didn't even glance at us, standing in front of her desk, until Tashi asked her a direct question. No seats on any Air China flight to Beijing were available that day or the next, she proclaimed curtly. We walked out, crossed the street, entered the China Eastern office, took the elevator up to the 6th floor and found a single bored looking employee behind a computer terminal. He too declined to look at us. Once again, when prodded by Tashi, without so much as looking at his screen, he also said no China Eastern seats were available. It was about this time that it dawned on us we were trying to travel at the end of one of those monster Chinese national holiday weeks, when a substantial number of the country's billion inhabitants all take to the road simultaneously. Also about this time, Woeser called and suggested we try the travel agent he works with, someone skilled at finding seats on domestic flights. By then Steve and I had managed to use my American Airlines app and ascertained that seats from Beijing to San Diego seemed to be available on Saturday. We happily told Woeser to go ahead and secure a flight to Beijing, if possible. A few minutes later, he called back and said she had snagged the last two seats for us on an Air China flight leaving Lhasa at 4 p.m. Friday. They were expensive — almost $600 each. On the other hand, to our amazement, the American Airlines Beijing-to-San Diego tickets we bought online cost less than that. 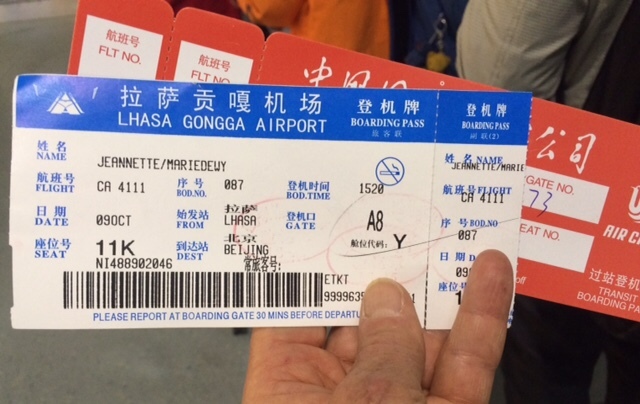 If it wasn't what we had planned, the flights from Lhasa to Beijing (via Chengdu) were pretty interesting, nonetheless. For this trip, we bought travel insurance that's supposed to cover “trip interruption,” so we think we'll be reimbursed for the costs of changing our plans. What we've lost and cannot recover is the opportunity to drive southeast through the harsh Tibetan landscape (which we were supposed to do Friday), see those Himalayans foothills that were on Steve's bucket list, sleep at the foot of Mt. Everest (scheduled for today), and take the two-day cross-China train trip from Lhasa to Xian next Tuesday, stopping there to see the fabled army of clay warriors created for China's first emperor. We're very sad about that, but we don't have any doubts this was the right thing to do. Even though Carol sounded better Friday morning (and never had to undergo any surgery), she appears to be facing critical decisions about her living situation, and as her only child, Steve is the person best situated to help her with those. Also, we keep reminding ourselves that the week we spent in Bhutan was wonderful. 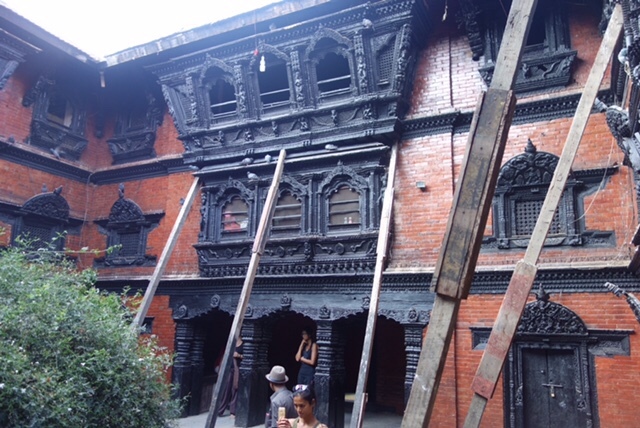 Our brief visit to Nepal made us long to return there. If like Heinrich Harrar, we had to leave Tibet earlier than we would have wished, what we saw during our short time there was incomparable. On the plane ride home tomorrow, I'll try to describe what our Three and a Half Days in Tibet were like. The pace of my blogging has been slowed by a couple of physical maladies. The first is the cold I finally succumbed to in Nepal (the one that appeared to start with Ugyen and Howie back in Bhutan.) Steve got it from them but seems to have recovered almost completely. I’m still a mess, but in my defense, the Roof of the World is not the optimal locale for getting over respiratory ailments. 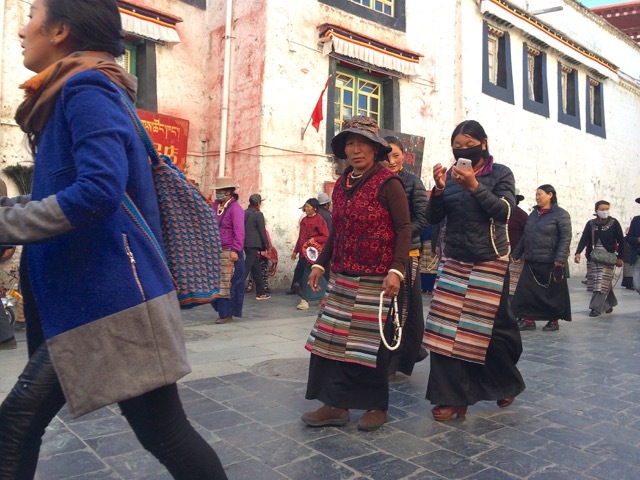 Even though we slept a couple of nights at 9000 feet in Bhutan, we immediately felt Lhasa’s 12,000-foot elevation upon our arrival Monday afternoon; walking seemed more of an effort than normal and climbing a couple flights of steps made my head spin. Mercifully, neither of us developed the killer headaches and disordered thinking that came with the altitude sickness we experienced in the Andes. But the lack of oxygen did trash my ability to sleep both the first and second nights here; if I got more than 2-3 hours, it sure didn’t feel like it. So exhausted that it felt almost physically painful, I crawled into bed both nights and felt like I was suffocating (the blocked sinuses didn’t help). That made me feel panicky and gave me insight into what congestive heart failure must feel like — icky. By Wednesday, climbing steps no longer felt impossible. But my nasal and sinus passages are still rioting. Whatever made us think it would be such a great idea to travel to Tibet? The biggest inspiration came from Steve, who has always longed to see the foothills of this region where the whole earth has heaved up so much that the bases of the Himalayas are higher than the tallest mountains in Europe or America’s lower 48. Bhutan, Nepal, and Tibet make a logical circuit for taking that in. But I have to say I didn’t begin to get really excited about visiting Tibet until Steve and I read Heinrich Harrar’s classic memoir, Seven Years in Tibet (upon which the much more recent Brad Pitt movie was based). Actually, we listened to the book while on a road trip this summer. Heinrich’s writing is only workmanlike, and parts of the book have the pace of a heavily laden yak. But overall it’s a wonderful (true) account of Harrar’s escape in the early 1940s from a British POW camp in India (where the apolitical Austrian mountaineer happened to be when Britain went to war against the Germanic axis.) The escapee made his way to the Tibetan border, slipped across, and with another German mountaineer managed to walk (over the course of a full year) to Lhasa. Over and over they were politely received but ordered in no uncertain terms to leave the country — then completely closed to foreigners. Heinrich and his buddy bamboozled and charmed and bullshat their way eastward. In the fabled capital, they were ordered out but again managed to worm their way into the Tibetans’ affections, and no wonder! 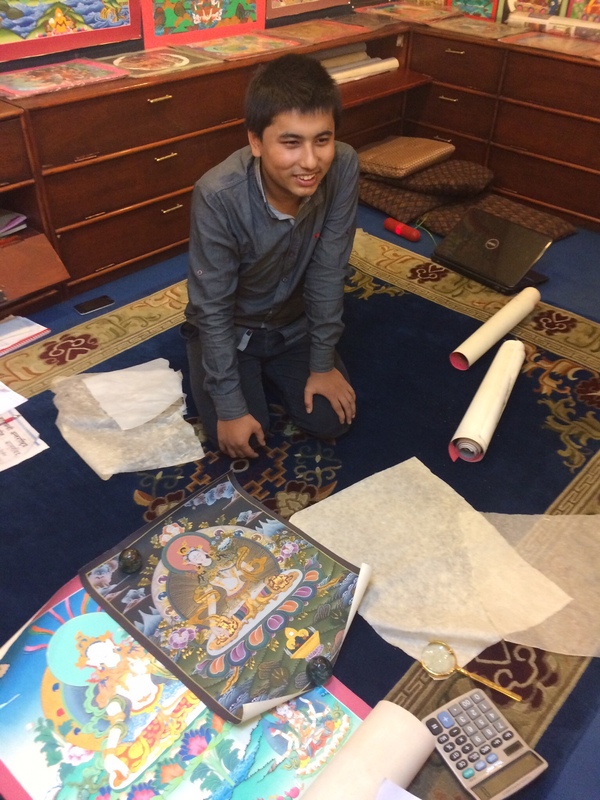 They were wonderfully talented fellows and not only figured out how to speak cultured Tibetan but also offered their services on public projects ranging from garden design to engineering. Eventually HH met, befriended, and became the tutor of the teenage Dalai Lama (the world-famous 14th incarnation, who now lives in exile in India) and he came to love Tibet so much he would have lived out his life here. Everything collapsed when the Chinese invaded in 1950, and HH fled to write up all his varied adventures. His book is a detailed portrait of life in a theocratic medieval society dating back well over a thousand years. I found it fascinating to think that he was taking it all in while my dad was going to high school in Chicago and my mom was settling into her first clerical jobs in San Diego. Upon our arrival here Monday, I had the fleeting thought it would be cool to see some of the places Heinrich describes in the book. When I asked our guide about it, though, he ruefully said he’s never been able to read it. The Chinese rulers ban it, as I should have known. We’d been warned that they sometimes confiscate copies of Lonely Planet Tibet when they find them in visitors’ luggage. Last month the authorities staged huge celebrations of the 50th anniversary of the establishment of the Tibetan Autonomous Region. (That was 15 years after they marched in and took over.) 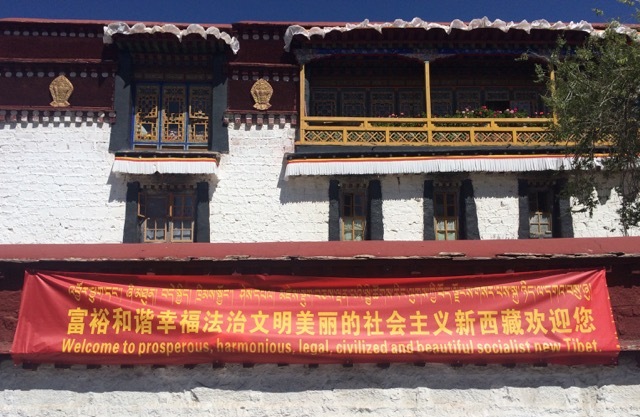 We saw giant red banners proclaiming, “Welcome to prosperous, harmonious, legal, civilized, and beautiful socialist new Tibet” and other obvious evidence of what they’ve done with the billions of dollars of investment they’ve poured into it. All the roads we’ve seen so far are broad and well-maintained. They’ve built a causeway and a tunnel that have cut in half the time it takes to get from the airport into town, and they’ve built the high-tech rail line that we’re scheduled to leave on next Tuesday. They’ve opened public lavatories all over the Old Town, and they employ a large corps of street sweepers that keep it remarkably clean. They’ve also set up security checkpoints around the biggest landmarks, in an attempt to prevent more monks from burning themselves alive (as more than 100 have done in recent times). Chinese soldiers march around with assault weapons at the ready, and they sit at stations with riot shields set up for action. Steve and I find all this interesting, along with the more homey features of life here. We think it’s the first time we’ve traveled in a truly polyandrous society. Our guide this afternoon told us about his one aunt who has four husbands (all brothers) and 9 children from them. (They call the oldest one “Father” and all the rest “Uncle”). And oh, by the way, all the sights we’ve seen so far have been world class. But I’m too tired to write about those now. I need to go to try to sleep (at least) before our final full day of touring in Lhasa before heading east to Everest Base Camp. (Also, I can’t post any photos tonight because of technical difficulties. You find a lot of that with the Internet in China.) I’ll try to add then whenever I can. By the end of last week, Steve and I were mulling over whether we should cancel our trip to Nepal. The news we were reading about the informal blockade at the Indian border sounded grim — with literally thousands of trucks stranded, the government banning fuel sales to private cars, and half the water-bottling facilities in the Kathmandu Valley closing because of their inability to operate. Some airlines were canceling their flights because of the lack of jet fuel for their return trips. Under such conditions, I wondered how long it would be before civil unrest broke out. Our worst nightmare was that we would fly in on Saturday, but be unable to get to the airport and depart Monday (October 5). If there had been any alternative, we might have gone for it. But the Chinese government’s impossibly difficult rules for visiting Tibet gave us no choice. The only place we could pick up our very expensive “group travel visa,” the arrangements for which had been in the works for months, was in Kathmandu. No visa, no Tibet. That simplified things. Also, our Kathmandu hotel insisted (via email) they would still be able to pick us up at the airport and get us back for the outbound flight. The friend of a San Diego friend, a high-ranking Red Cross official, replied to my worried query that he didn’t think the Nepali government would leave tourists stranded. “There is a lot within walking distance of [your] hotel,” he continued. “If I were gambling person, I’d give you more than a 50% chance of success and a 100% guarantee of more good stories to tell about this journey.” That cheered us up. This prelude partially explains why we felt almost giddy with happiness over the way things played out. Going through the government formalities upon our arrival Saturday morning at Kathmandu airport (getting a visa, going through immigration, customs, etc.) was complicated but efficient; we didn’t wait in any line for more than a minute or two. 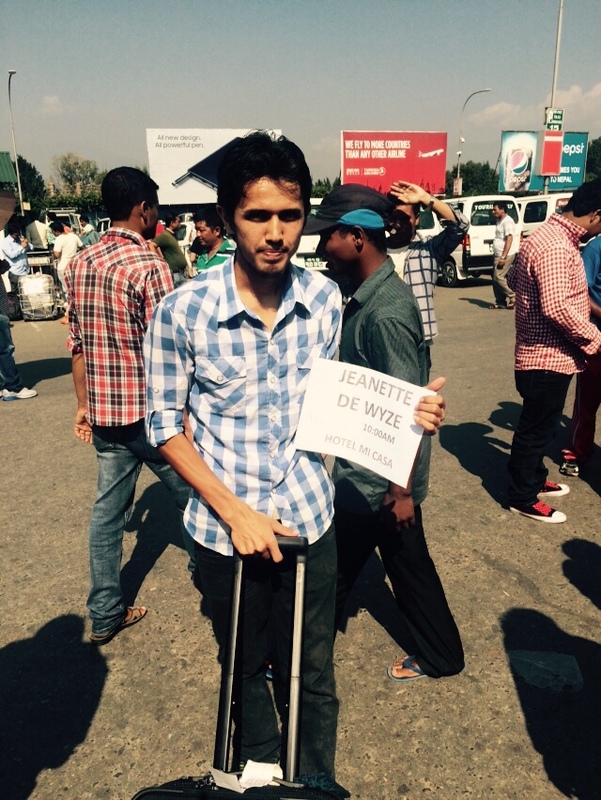 We felt a small stab of fear when none of the drivers waiting outside the terminal held a sign with our names. But our guy showed up soon and loaded our bags into a clean and well-maintained Suburu microvan. The weather was splendid — sunny and warm, and as we drove through the city, traffic was light but by no means non-existent. Motorbikes, vans, taxis, and other private cars sped alongside us. We noted some signs of damage that may have been caused by the two monster earthquakes that slammed Nepal in April and May, but the parts we drove through didn’t look flattened — far from it. 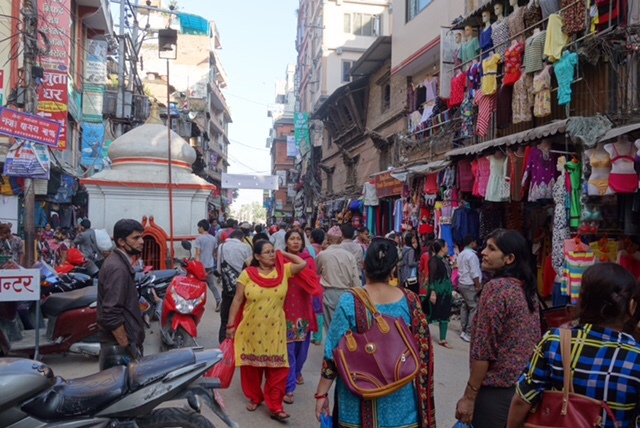 Soon we reached Thamel, the tourist district where our hotel is located, where again, vehicular traffic was light. The buildings lining the narrow streets, however, were crammed with a wild profusion of shops and businesses, past which strolled an international throng that made for a livelier street scene than anything in San Diego other than maybe the Gaslamp District during Comic Con. I have a friend who traveled in Nepal years ago and then returned for another visit in 2010. At the time, he expressed surprise over how much Kathmandu had deteriorated over the years. Based on this report, Steve and I were braced for substantial squalor. What we found when we strolled around confounded our expectations. The jumble of streets that make up Thamel (the tourist district) obviously are a huge magnet for trekkers and mountain climbers. Every block is jammed with outfitters and shops selling outdoor gear. They’re crammed in alongside ATMs, tattoo parlors, backpacker hotels, bars and restaurants, and shops selling jewelry, music, books, religious paintings, incense, singing bowls, t-shirts, prayer flags, prayers beads, and so much more. 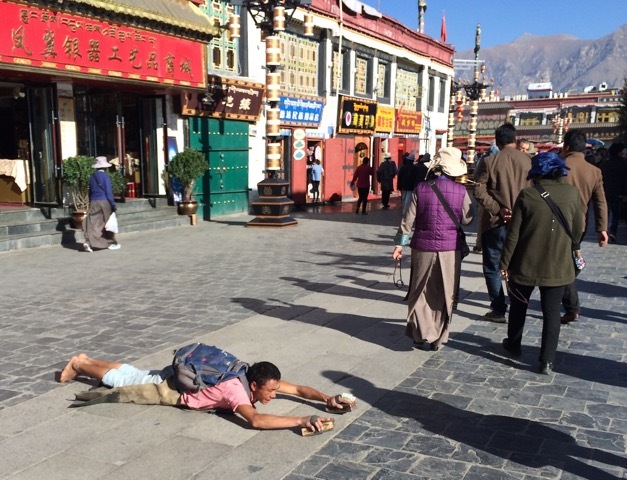 The folks strolling past the shops are just as intriguing: 20-something backpackers, plump Chinese tourists, Indian holy men, deformed beggars, and rugged mountaineering types who look like they’re heading for Mt. Everest to do something other than take pictures. Music and incense spill into the streets from the shopfronts, mixing with the constant chorus of honking motorbikes. The restaurant at which we ate lunch — along with every other place we ate — had a palpably cosmopolitan, if slightly grubby, stylishness (and the food was an order of magnitude more interesting than anything we ate in Bhutan). 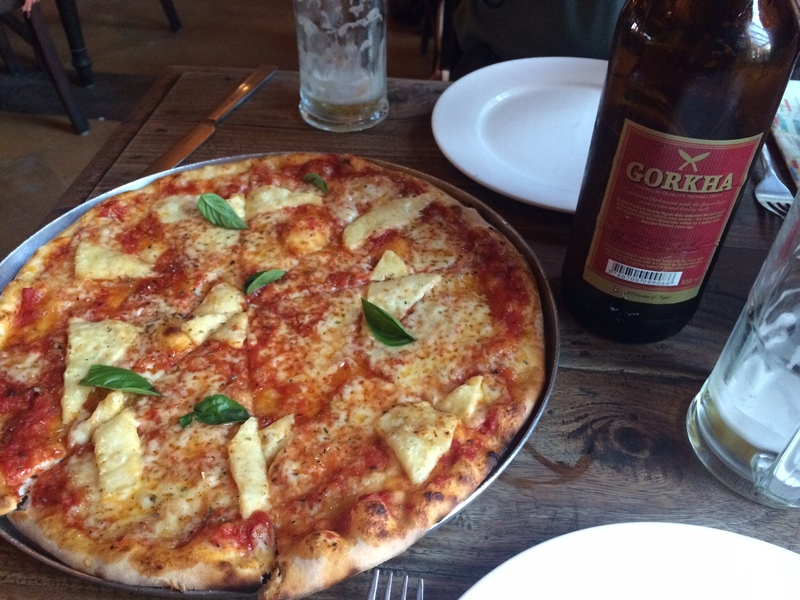 Our first yak cheese pizza! I realize now that I shortchanged Nepal. 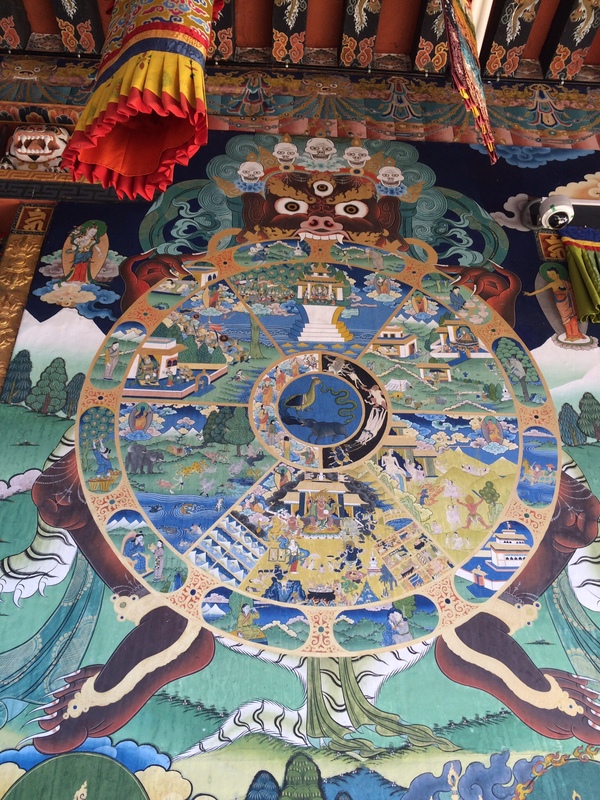 If we’d been able to stick to our original plan and travel from Kathmandu to Lhasa overland, I would have dug into researching what we should see and do. 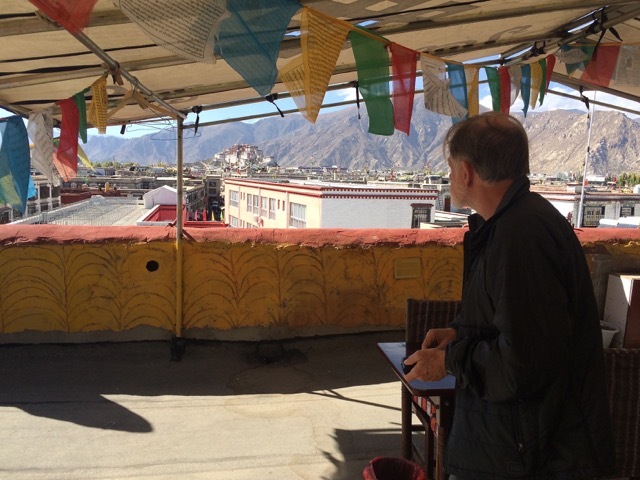 But when the earthquake closed the Chinese land border and our stay in Nepal shrank to barely two days (because of the limited flights to Lhasa), I figured we’d simply secure a city tour through our guesthouse. By Saturday afternoon, however, we both were fighting the cold we caught in Bhutan as well as feeling that we’d overdosed on temples and guided tours. “We’re just going to take it easy and chill,” Steve declared. 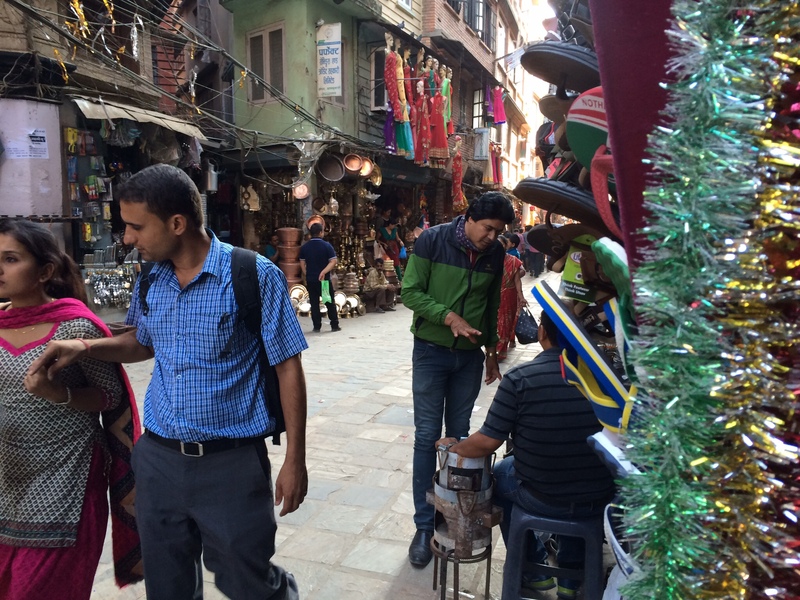 We would stroll around Thamel and shop and get back to serious touring in Tibet. The merchants of Kathmandu uniformly charmed us. They never hustled or pressured us but came across as helpful and hospitable. This was the scene we encountered once we left Thamel. This worked okay Saturday afternoon and Sunday morning. The stores’ offerings enticed even Steve to shop with zeal (almost unprecedented.) By mid-afternoon, I was worn out; my cold started later than Steve’s so he’s further down the road to recovery. While I rested, he learned from Lonely Planet Nepal that the Kathmandu Valley has more World Heritage Sites than any other area on earth. There wasn’t time to see the vast majority of them, but Durbar Square — the traditional heart of the city and site of its most spectacular architectural treasures — was only a 20-minute walk from our hotel, according to the girl at the front desk. We promptly abandoned Plan Chiller and set off to find it. And thank God we did! Within minutes Thamel’s paved streets gave way to dirt and ancient cobblestones, and we saw more evidence of where the earthquake gods had lain their heavy hands: piles of rubble, wooden braces holding up the sides of buildings, bricks stacked up for rebuilding. The population strolling alongside us exploded and changed from maybe 50% Nepali to more than 99%. Many shops offered cheap goods, but some items for sale — hand-beaten copperware, saris — looked as alluring as the handicrafts in the tourist zone. When we got confused about the route, people cheerfully directed us. So it was that we found our way to Durbar Square, where Nepal’s ancient kings once were crowned. We brushed aside the offers of guiding; it was too late in the day and we were too tired to digest a lot of facts. Still, the mere fact of strolling around the vast spaces and ogling the fantastic buildings gave us a hint of the past cultural and architectural glories of this country. 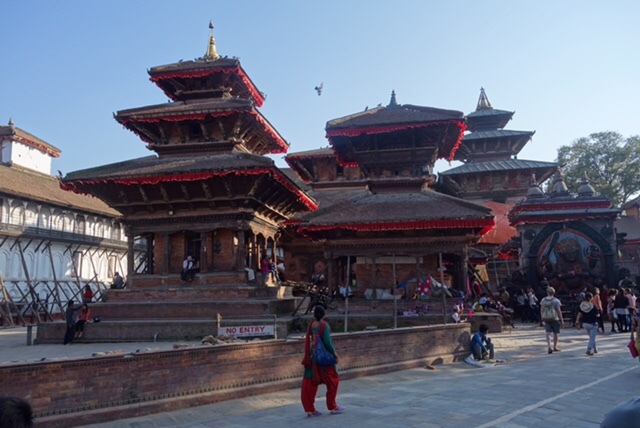 One of Durbar Square's many fantastic buildings. Many appear to be badly damaged by the quake, but we could see what they looked like pre-disaster. One amazing thing happened. Even though we didn’t hire a guide, a couple of them advised us to see the Living Goddess. We wouldn’t have had a clue who that was, were it not for the National Geographic article that Steve read (and passed on to me) a few months ago. It detailed the bizarre life of the Tantric Buddhist Nepalese virgins selected to carry out the duties of goddesshood. Once they start menstruating, these goddesses, call kumaris, must retire. (They can never be sullied by blood of any kind.) If the article mentioned that among the duties of the kumari who was the article’s central subject was routine public appearances in Durbar Square, we had completely forgotten that. We avidly made our way to the house where she lives and were told that within a minute or two, she would make her final public appearance of the day. The inner courtyard of the living goddess. We couldn't take pictures of her. We weren’t allowed to take any photographs, so I have to describe what happened. From the open second-story window, the divine 10-year-old, dressed in colorful silks and wearing more eye makeup than an old-school movie star, popped into view. Looking down at the small crowd of tourists, she looked bored, then fixed her gaze on me and stared. I think this lasted for maybe 10-15 seconds, long enough to begin to make me uncomfortable. Then she abruptly wheeled about and disappeared. The Nepalese say that seeing the goddess brings good luck. Certainly we thought it as near-miraculous to come upon her appearance, as we did. If we’d tried to plan it, I can’t imagine we would have succeeded half as well. This morning (Monday), our good fortune continued. We got driven back to the airport with no problem. We took off on time and landed in Lhasa to cloudless, sunny skies. The next phase of this high-altitude adventure has begun. 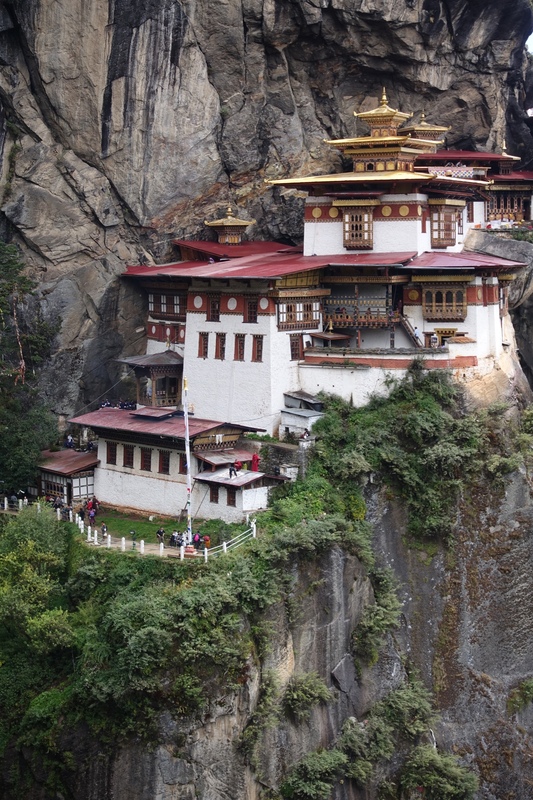 All foreign flights into Bhutan land at Paro, and for many tourists, their first destination is the nearby 17th-century Taktshang Monastery, more commonly known as the Tiger's Nest. We did the reverse: saved that adventure for Friday, when all of us would be departing the next day (Howie and Donna to Thailand and Steve and I to Nepal). I'm so glad we did. First, it gave us all four days to get used to the altitude. The Paro Valley is at about 7,400 feet, but the monastery clings to a clifftop that's more than 10,000 feet high. As our guidebook noted, the only way up is to hike, rent horses (which can only go halfway), or fly up on a magical tiger. The latter is rare, but the legendary Guru Rimpoche, who brought Buddhism to Bhutan from Tibet centuries ago, allegedly ascended that way to subdue a resident demon. Besides better preparing our bodies, saving the Tiger's Nest for last also made sense from the perspective of theater. A visit to it makes for the grandest of grand finales. None of us, including Ugyen, understood this one. The trailhead was jammed with minivans, SUVs, and other other assorted vehicles, and we felt for the first time like we were approaching a major tourist attraction. (At so many places, we were the only foreigners in evidence.) Howie and Donna rented sticks for about $1 apiece, but Steve and I had new collapsible hiking poles, with which we have fallen in love. For all of us, the sticks felt indispensable. They made me feel more secure on the uneven, narrow, and invariably steep pathway, and they provided some cushioning for my much-taxed knees. For the first half-hour, the hike up was pleasant and demanding, if unremarkable; scattered clouds and forest cover kept us cool. After about an hour and a half, we arrived at a simple “cafeteria” where I downed a quick coffee and we all drank in our first views of the monastery — so improbably dramatic it looks like it could only have been dreamed up by some studio CG team. We also felt encouraged, as we seemed to have almost reached the same altitude as the monastery, and the distance across the gorge between our cliffside and its didn't look that daunting. This was illusory. Yeah, we look okay, but check out the monastery in the distance. You can see some of the final stairs descending down, and way in the distance the beginning of the up stretch. The path onward varied between steep and fairly flat, but we trudged along it for an alarmingly long time. 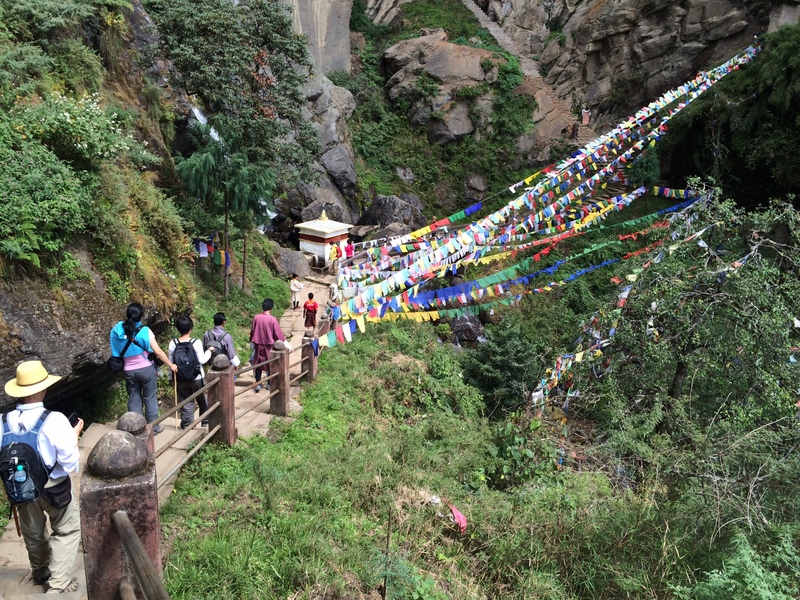 Then we rounded a bend and my heart sank to see the final barrier to reaching the monastery. We would have to descend a long series of steps leading to the end of the gorge and then slog up what looked like an equal number leading to the monastery entrance. We all kept going at a steady if slow pace. Part of our slowness resulted from the compulsion we all felt at every turn to try to capture the staggering drama of the site. The monastery is a feat of construction that rivals the Great Pyramid at Giza. It's not the size of the building but its impossibly difficult locaton that makes it so extraordinary. Somehow, humans built it on a sheer rockface thousands of feet above ground level. I can't say the interior matches the outside. The inner walls bear some elaborate and complex paintings, and the passages lead to a number of beautiful shrines, where once again my eyes crossed as Ugyen regaled us with stories about the holy men and demons and incarnated lamas who had inhabited or meditated here at one time or another. After a while, we all were starving (it was well after 1 p.m.) so we started the long hike down. Our Genuine Bhutanese Stone Bath Experience that evening paled in comparison with the Assault on Tiger's Nest. We hadn't sought it out; rather, our tour operator had thrown it into the package at no charge. For it we drove to a guesthouse just outside of town where the staff had been “roasting” stones for a couple of hours. 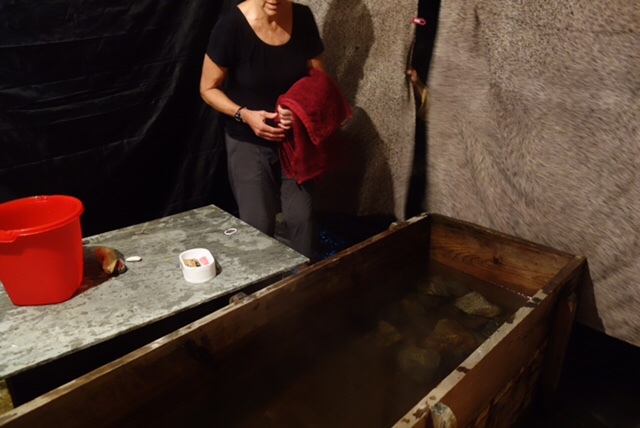 They led us to a wood pavilion out in what felt like the backyard and showed us the three coffin-shaped wooden “tubs,” each maybe 7 feet long and filled with water that was heated by the pile of stones in one end of the vessel. One of the girls pulled flimsy cloth partitions between the tubs, then they shooed Steve and me into one. I was struck by how different the protocol seemed to be from that in Japan, where thoroughly scrubbing and sanitizing every inch of one's body is de riguer before getting into the steaming tub and soaking there. In Steve's and my little cubicle, I stripped off my clothes and made a clumsy effort to wash up with the square of soap and plastic cup (for scooping water out of the tub) with which we had been provided. But within a minute I gave up and climbed into the tub. A minute later, Steve joined me. I could see Donna's head sticking out of her tub a few feet to my left (the cloth partition being too short to afford complete privacy). More comic still was the fact that Ugyen and our driver Tandin together climbed into the third tub, beyond Howie and Donna. Ugyen wasn't naked, something I know because at one point he insisted we needed more hot stones, climbed out of his tub, dashed outside, grabbed some with a tongs, and plonked them into our tubs. It was relaxing, if somewhat grubby and pretty hilarious, and when we all dried off and dressed and went into dinner inside the guesthouse (more red rice! more potatoes! more green beans! ), I was ready to fall asleep at the table. 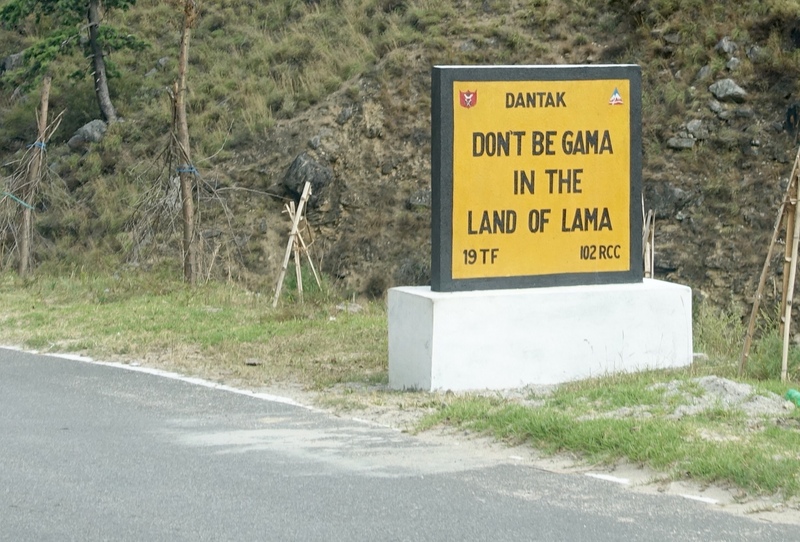 Besides the life-threatening roads, the extremely limited diet is definitely the worst part of visiting Bhutan. I had read this in advance and thought I was prepared for it, so I was startled by how irritating it became in just one week. As our plane climbed up and out of the Paro Valley this morning (Saturday), I reflected on how almost everything else was simply wonderful: the fabulous art and architecture, surrounded by the peerless scenery and inhabited by such warm and welcoming people — almost all of whom speak serviceable English! One brainstorm of the previous king (I think) was to dictate that all schools in Bhutan teach most subjects in English, a policy that has rendered all the younger generation bi- (and often multi-) lingual. That king (who abdicated a few years ago to let his son take the throne) is the one who set Bhutan's famous Gross National Happiness policy. It's not crystal clear to me just how well that's working. We saw an awful lot of grinding poverty, and while education may be free to all Bhutanese children, people talk about how hard it is to find any job. Medical care is also free, even to foreigners, we discovered firsthand. On the day we toured around Thimphu, we stopped into the campus of the national center for alternative medicine. There wasn't too much to see, but on a whim, Howie asked Ugyen if he might get a consultation regarding the sore throat he had developed the previous day. 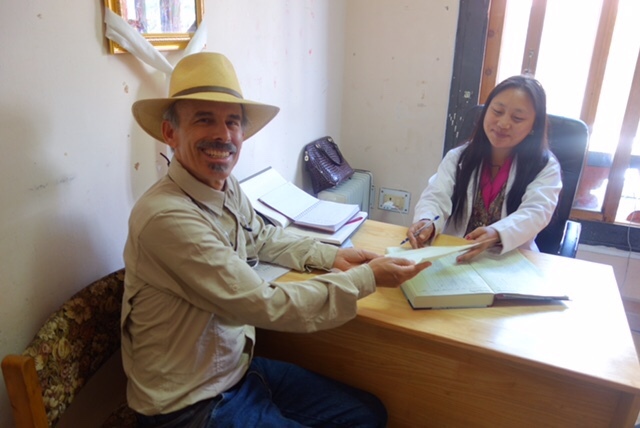 Ugyen made an inquiry, and in less than 5 minutes, Howie (along with all the rest of us) was ushered into the office of a senior physician, a pretty but serious, white-coated young woman behind a desk. She asked Howie a few questions, taking careful note of his answers, but she never looked into his mouth or did any other physical examination. Instead, she wrote out a prescription and directed him to have it filled at the “pharmacy” a few doors down. Howie turned in the paper there and was told to wait until his number (118) flashed on a little display. Barely a minute passed before it did. He then collected the pills (to be taken twice daily) and dried herbs (to be boiled into a tea before breakfast). Indeed, there was no charge for any of this, though he gave something as a donation. I have no idea if any of it was effective; he was still battling the cold when we bade goodbye last night. If the jury's still out (for me at least) about the efficacy of the Bhutanese health-care and happiness policies, one thing I'm certain of is that Bhutanese cows must be the most blissful cows on earth. 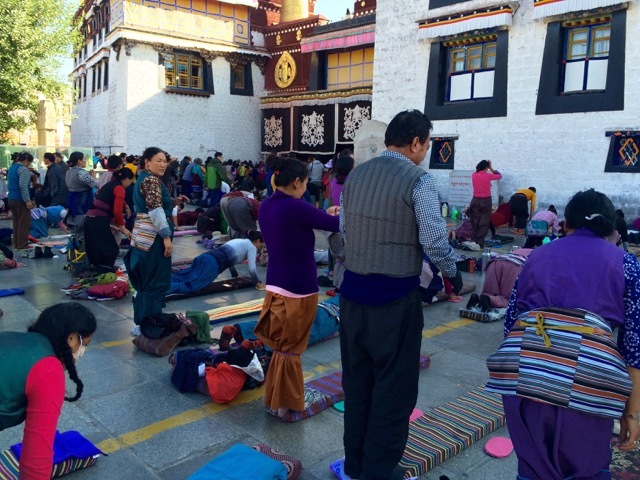 They're not sacred in Bhutan (a Buddhist country, not a Hindu one). But their owners (who keep them for the milk rather than their flesh) let them wander freely throughout the countryside even though they're not branded. Ugyen insisted that they find their way home every evening on their own. They use the footbridges and they balance gracefully on the hillsides, munching the luxurious grass. They wander out onto the highways, and somehow drivers don't seem to hit them. 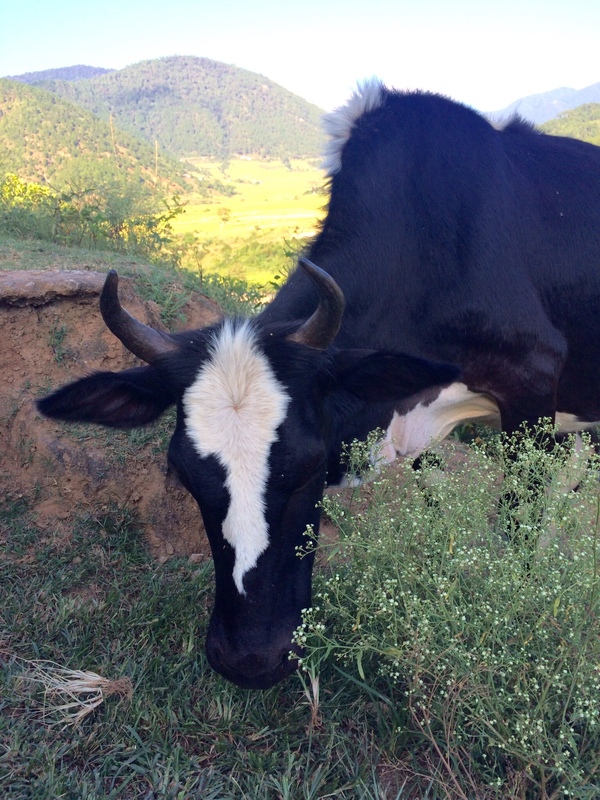 If I ever have to be reincarnated as an animal, I want to come back as a Bhutanese cow. For now, however, Steve and I are alive and well in Kathmandu. Our plane pushed back from the gate 10 minutes early, and within minutes we were catching thrilling glimpses of Himalayan peaks from our window. 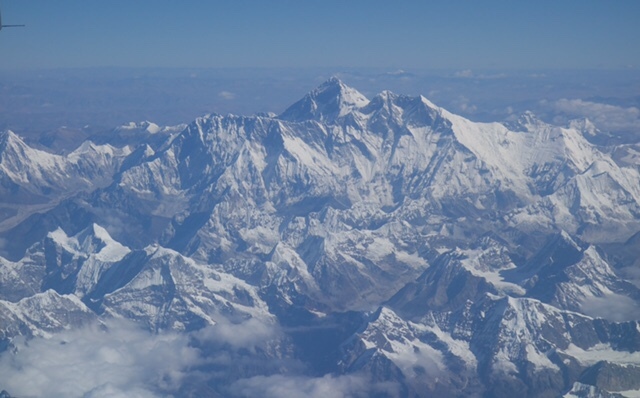 As we neared Kathmandu we had a picture perfect view of the cluster of mountains that includes Everest. We think that's Everest looming in the distance. I felt moved almost to tears at the sight of the tallest place on the planet. Since we landed, everything on the ground has been pretty sublime too. We got back safely to Thimphu yesterday around 5, after a three-hour ride that was less terrifying than our previous drive. Donna and I calculated we were frozen with fear only a dozen or so times; it probably added up to only 15 minutes of terror (in contrast with the solid two hours or so on the road between Punakha and Gangte.) Return to the nation's capital also meant a slightly better electronic link to the outside world. In Gangte, our destination for the sacred dance festival, there was no wifi at our hotel. 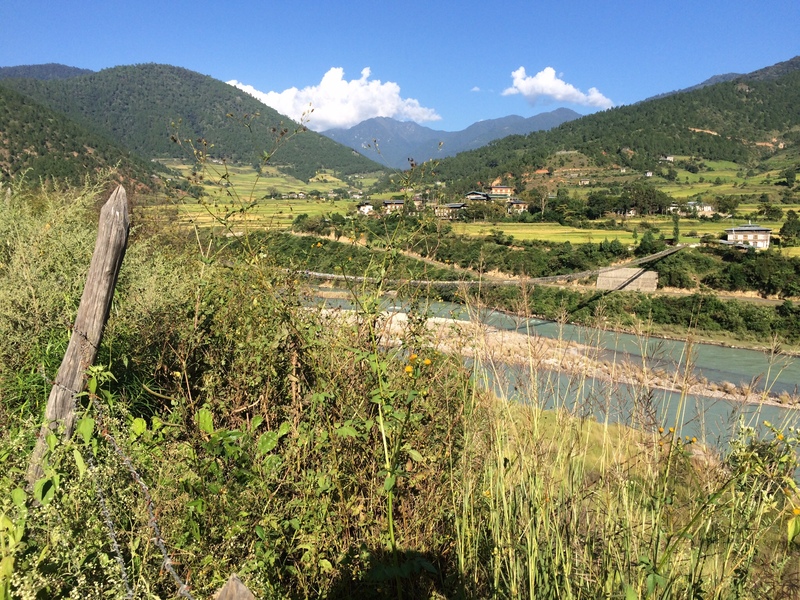 “You can't get it anywhere in the [Pobhjikha] Valley,” a local guide declared. As no one in Bhutan appears to have the ability to get Internet on their cell phones (worse than what we've seen most places in Africa), we were pretty much completely cut off from news of the world. The one exception came when, after we were strolling near the village, we came upon an elegant hotel with stunning views of the valley. Most of the hotels that are included in the standard daily tourist rate are pretty basic — comfortable but plain. But in recent years some luxury properties have been developed for which the 1% pay astronomical surcharges. The Gangte Lodge, at $850 per day, was one such. For that fee, you not only get a room with the killer view, but also attention from perhaps the nicest concierge I've ever met. Rosina (a pretty Argentine) gave us a tour of the property and also loaned us a set of darts so that Ugyen could demonstrate the game for us on the lodge's dart court. She let us use the swanky bathrooms and allowed us to make a reservation for a 6 p.m. prix fixe dinner. It was a splurge, but we were all ravenous for something other than the plain rice, sauteed vegetables, noodles, and stewed potatoes that seem to be the only thing on the menu at more plebeian hotels and restaurants. 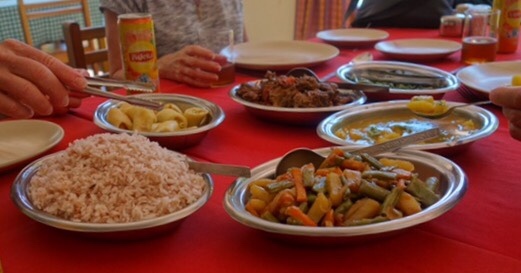 This is THE basic meal of Bhutan. We've eaten it about a dozen times now. Tasty enough but BORing. 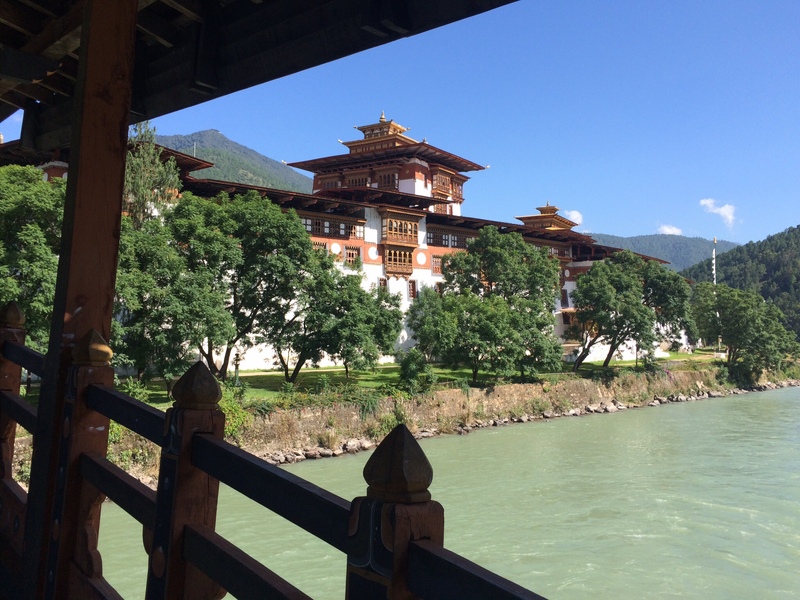 We didn't get connected again until we returned to Punakha. The wifi at our hotel there was sketchy, but good enough to enable me to check my email and find a disturbing message from our agent in Kathmandu — the guy securing our visas for Tibet. (It's too tedious to explain all the details here, but basically he was demanding almost $200 more for Chinese visas than he had said they would cost.) Even more disturbing was the news Howie saw in the New York Times about Nepal's border with India being closed due to political turmoil over the newly enacted Nepali constitution. The Nepali-Chinese border has been closed since May, due to the monster earthquakes, so this latest turn of events basically cut off Nepal from receiving any supplies, including gasoline, diesel, and jet fuel. This was worrisome. Steve and I MUST get to Kathmandu in order to obtain our visas for Tibet. There's no alternative. But if the city is running out of fuel, might we be unable to get from the airport to our hotel and back? Might our flights be canceled? 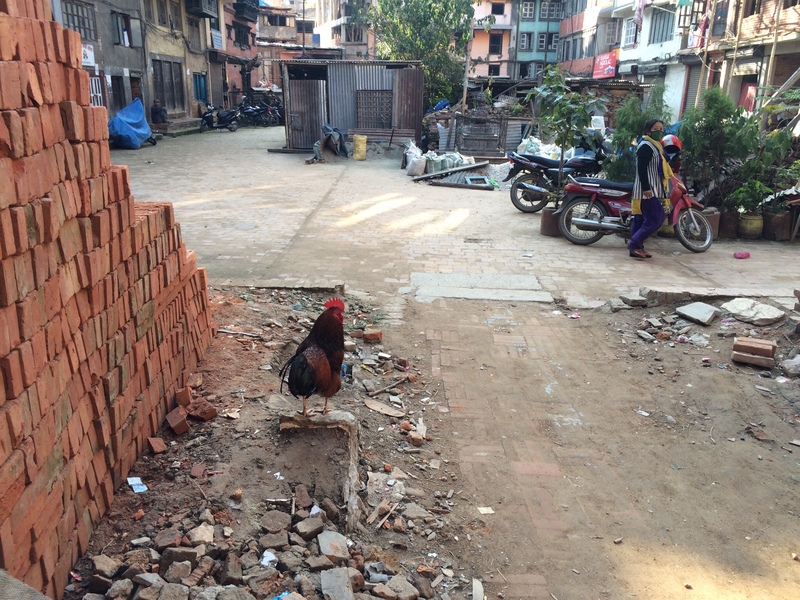 Could we get stuck in Kathmandu — at an ugly moment? We've done a lot of checking since we learned this news Tuesday evening. We've communicated with our travel agent in Tibet, with the one in Kathmandu, with our Kathmandu hotel, and with the head of the international Red Cross in Nepal (who happens to be the friend of a friend and who we were/are supposed to visit there). All the above feel we'll be okay, and our Bhutanese travel operator has confirmed that our flights in and out of Nepal should be flying as scheduled. So unless the situation takes a turn for the worse, we appear to be good to go. ….we spent a lot of time in the central temple — a space so vast it reminded me of Notre Dame cathedral. But instead of the relative austerity of the latter, virtually every surface in the temple was painted or carved (or both) with a staggering profusion of colors and exotic imagery. Afternoon sunshine poured in through a few of the upper windows, and thin trails of incense floated up in it. Temple visitors are not allowed to take photos. This one was outdoors, however, one example (out of millions) of the extravagant and ubiquitous ornamentation. We started off the next day by visiting a recently opened nunnery. One of its buildings is a temple not as large as the one at Punakha Dzong, but it seemed even more insanely decorated, if possible. I sat for a long time on the parquet wood floor, varnished to a high gloss, and tried to identify a single color that wasn't present in the room. I failed. In addition to all the primary and pastel hues, a plethora of textures competed for my attention: richly embroidered silk fabrics, a milky glass chandelier, hammered brass hardware. As if all this wasn't enough, outside, we found a huge crew of young Buddhist nuns clamboring all over the dome of another structure, white-washing it. At the sight of those maroon-robed, crewcut-coiffed, paintbrush-wielding young women, Howie gasped with pleasure and spent the next half-hour or more trying to capture the flurry of activity with his Sony camera. When we finally pried him away, he said it was the best photo shoot of his entire career. A couple of the girls stirred up the whitewash. Howie should be producing an amazing photo essay sometime soon. There's simply too much more to describe; I don't think it's possible to communicate all we've seen and done. 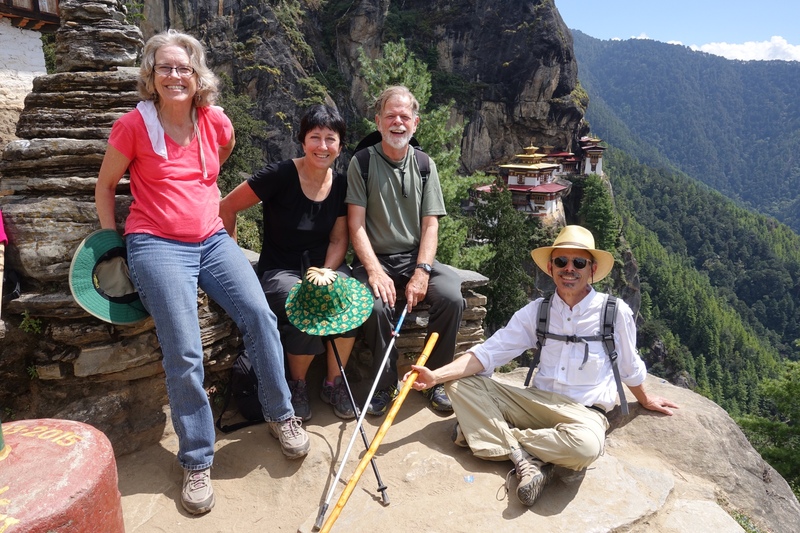 And tomorrow we still have one more day, a day in which we'll be climbing to the top of Bhutan's most famous monastery: the Tiger's Nest (followed by an afternoon in a traditional farmhouse). I probably won't be able to post again tomorrow, before we take off to Nepal. But if all goes well, the lines of communication there will be open and running smoothly, and I'll have some time to report. That string across the river is actually a foot bridge -- second longest in the world, according to our guide. Donna and I tied prayer flags to it. Hopefully they'll help ensure our safe travels in the next few days.